The Compassionate Glutton meets the Compassionate Shepherd. When i was a child, my mother would make the dish to end all dishes. Sweet, crunchy corn, mushy peas and perfectly mashed potatoes, burnt to a light crisp on top came together to create scrumptious Shepherd’s pie. (Ground beef was also in there, but really, this blog post is about eliminating that component, so i am not listing it as a yummy ingredient. Take that, ground beef.) I remember dousing my portion in ketchup, delighting in the mix of different textures and flavors coming together to form one. I haven’t had Shepherd’s pie in over 3 years, since giving up meat. This weekend, Shepherd’s pie was brought up in conversations with different people i crossed paths with at least 3 times. I already had this dish in the back of my mind after an extensive conversation with the B, comparing our mothers’ versions (Peas NEED to be in there!!! ), when i went to visit my parents on Sunday evening. My pops had come across a recipe for Shepherd’s pie with lentils, and had thoughtfully bookmarked it for me. I initially got really excited; i had been toying with replacing the ground meat component with lentils for some time. After a quick scan, i realized the recipe was not vegan (why add veal to the lentils? That’s just silly! ), and was inspired to create my own version. Put lentils, piece of veggie bouillon cube, water and onion in a pot, and heat on high heat. Once lentils are boiling, lower heat to simmer, and cover. Stir frequently so lentils do not stick to bottom. Simmer for 35-40 minutes, or until hardly any liquid is left. While the lentils are cooking, prepare the potatoes. Peel and chop sweet potatoes into bite size chunks. Throw into a pot and cover with water. Add a pinch of salt if desired, and boil potatoes until they are soft enough to mash. 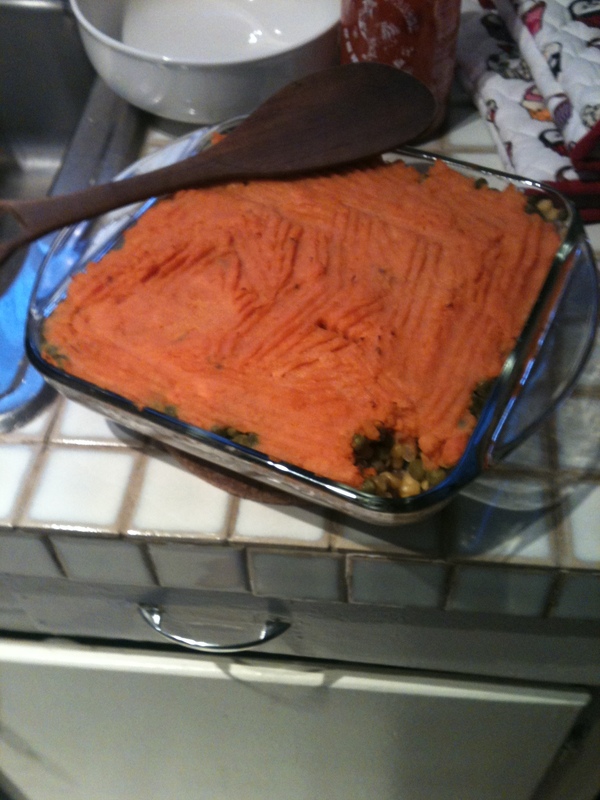 Mash sweet potatoes with a bit of vegan margarine, until no lumps remain. Pour lentil-onion mixture into pyrex pan. Make sure the bottom of pan is completely covered. Pour can of corn on top of lentil layer. Por can of peas on top of corn layer. Scoop up mashed potatoes and spread on top, as the final layer. Use a fork to get the potatoes all over the top, so that it completely covers the top. Cut 2-3 thin slabs of margarine, and place on top. Bake in a 350 degree oven for 35-45 minutes, until a fork placed in center comes out piping hot throughout the middle. For last 5-10 minutes, place your oven to broil, and broil the top of the pie so the potatoes develop a crispy top layer. Oh Compassionate Shepherd, you complete me. This dish easily made 4-5 portions, enough to bring for lunches this week! The lentils pack lots of protein, while the sweet potatoes give the dish a hearty feel without being too heavy. This is the perfect dish when you’re looking for comfort food, without the unnecessary calories!